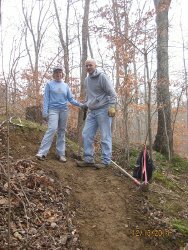 WHO WE ARE The Knobstone Hiking Trail Association (KHTA) is an Indiana non-profit corporation whose members are dedicated to the completion, preservation and promotion of the Knobstone Hiking Trail. Incorporated in 2013, membership has already grown to over 100 members from 9 states. We’re all life-long hikers who have decided on a method of “payback” for our luck by helping create a stellar new opportunity for those who follow us. NEXT: OUR MOST IMPORTANT WORK now is bringing new sections of the provisional trail into the permanent route of the Knobstone Hiking Trail (KHT). 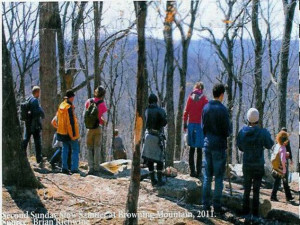 Photo at right shows hikers on iconic Browning Mountain, on the proposed KHT route through the Hoosier National Forest. Dynamic KHTA Executive Board members are approaching government agencies and private landowners to negotiate trail access agreements. WHO: KHTA ANNUAL MEETINGS are an opportunity for members and the entire community to learn about the work of building this historic trail, and how to join in its last phase. The photo at right shows Jerry Pagac (right), originator of the Knobstone, working with the Indiana Department of Natural Resources in the 1970s, and Joe Payne, its builder, speakers at, respectively, the first (2014) and second (2015) KHTA Annual Meetings. These meetings are held on 3rd Saturdays in March at the Lutheran Hills Church Camp, along the Tecumseh Trail in Brown County. JUST LIKE TO HIKE? 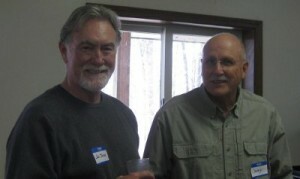 The KHTA offers two opportunities to get to know the trail better and meet other members as well. In June, join us for a National Trails Day hike featuring a trail easement section. In October, try a Browning “Mountain” Backpack or Dayhike on a section of the provisional Hoosier National Forest Salt Creek Trail route, to see Indiana’s spectacular colorful fall foliage. Check us out on: Activities. Or, you can make a contribution by monitoring a favorite trail section, and reporting problems by becoming a Trail “Angel” Adopter. JOIN: NO TIME TO HELP? Everyone appreciates the support of members who simply lend their financial and psychological support by joining the KHTA.